From books and TV to movies and games, our lives are full of images of our possible future lives with robots - some appealing, some nightmarish, some simply weird. What might future robots be like and might we want to be friends with them? Why are we so fascinated with robots anyway, and what does this tell us about ourselves? Join Prof Tony Prescott, psychologist, neuroscientist, and director of Sheffield Robotics, to explore how far we've come in creating the robots of our science fiction dreams, where we might get to in the future, and whether all of this is really such a good idea. 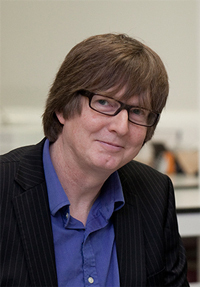 Prof Tony Prescott (http://www.abrg.group.shef.ac.uk/people/tony/) is Professor of Cognitive Robotics at the University of Sheffield, and Director of Sheffield Robotics, a cross-disciplinary research institute with over one hundred researchers. He is the co-creator of the animal-like robots Scratchbot and Shrewbot. He also writes and speaks about the societal and cultural impacts of future robotic, AI, virtual reality and telepresence systems, with particular focus on how these technologies are changing how we see ourselves.